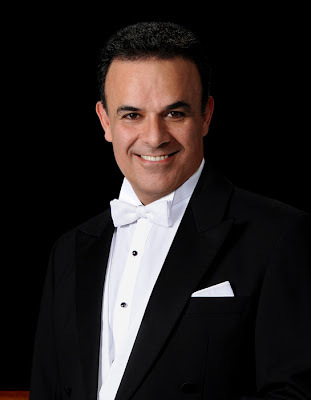 Mexican tenor Fernando de la Mora has performed all over the world, and not just opera. De la Mora, our Sunday/Friday Don José in Carmen, is also renowned for his career as a singer of popular and traditional Mexican music. He's recorded nearly 30 albums, performed in some of the world's most important theaters, and has a career spanning more than two decades. Yet, this is his first-ever visit to Seattle. We recently chatted with De la Mora and asked him about his unique career, singing in Spanish, and what he enjoys most about playing Don José. How did you first become involved in opera? I became involved in opera because I wanted to educate my voice, and my teacher was involved with the National Conservatory in Mexico City. She put me into the Conservatory, and I really discovered the beauty of opera. It’s an endless field, and everything can astonish you. I was hooked immediately. But I saw a career in opera as only a dream; I had been studying business administration in college. I also married very young, and I needed to be responsible and have a job that could support my family. So I decided to go for another one of my loves, popular music. And opera became my hobby, because I didn’t think that, in Mexico, opera was ready to be a good business. So I became a popular singer in Mexico, and an actor. I made a movie, was in a soap opera, and I did commercials. But opera was still my love. 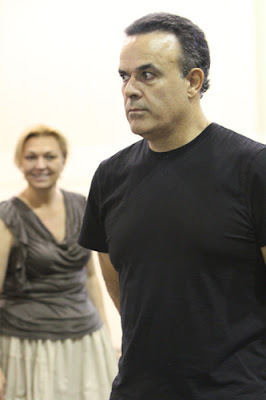 Fernando de la Mora (Don José) and Malgorzata Walewska (Carmen) in rehearsals for Seattle Opera's upcoming production of Carmen. The two perform on October 21, 23, and 28. How did you transition from a career in popular music to one in opera? At the time, I hadn’t yet discovered that there were thousands of theaters outside of Mexico where I could sing opera. My sights were just in Mexico. But I had two kids from my marriage, and I felt very complete with my marriage and my kids. And then—POW!—my like suddenly broke apart; my wife and I decided to separate. At the same time, I had the opportunity to audition for Bellas Artes in Mexico and they offered me a big role outside of Mexico City, which was a big success. Suddenly, I became very important for the company. I had been famous before, but when I became an opera singer, it was like an avalanche. Then, suddenly, my teacher told me, “Explore the world outside Mexico. They will offer you everything and you will never want to leave—but you need to go.” So I stopped my career to study for two and a half years in New York, and did some wonderful coaching. And then my career really started! I had an agent right away, and I made my American debut in San Francisco, my European debut in Cologne. After that, I was in Vienna, Berlin, La Scala, Covent Garden, Liceu de Barcelona, the Met, and all these doors were opening. I also married again and had two more kids, so all four of my kids travelled all the time, all around the world with me. It was very complicated, but very beautiful! I also decided to keep performing Mexican music, because it’s a beautiful country with beautiful music. I’ve taken Mexican music to Japan, South Korea, to Europe, many places in America and South America. It’s very popular, and people seem to like it very much. And I also became the producer of my own records (I have almost 30 in my career). So I like very much how my career has unfolded. It’s very easy to get bored because you are repeating and repeating and repeating the same things every day. But the secret is to love it. And when you love, you are attentive, and respectful. You respect the music, the colleagues. And you continue studying, growing, and revising your technique. Is opera more popular in Mexico now than it was when you started your career? Yes, the opera lovers have grown a lot—there are maybe 10 times as many! Before, it was a very closed, elitist circle. Now it’s more cultural, and less about money. You don’t need to be rich to be a part of opera, but you do need to be intelligent. You need to be sensitive. You need to have feelings. This is what we didn’t understand before. Opera is for anyone who has a soul, who has una alma inquieta (a restless soul). I’ve done quite a lot of opera in Mexico in the past 20 years. I like very much to perform there because the Bellas Artes theater is gorgeous, and I have a lot of friends there who have known me since I was a baby singer, and have heard me grow. Have you had the chance to sing any opera in Spanish? Yes, a few times. I did La vida breve by Falla (his only opera—a small opera, but with gorgeous music). And I also did Rappaccini’s Daughter by Daniel Catán, for his 1994 U.S. debut in San Diego. It was a great success, and was very well-received. I’m very sad that he passed away this year, in the middle of his glory. He was really starting to be somebody very important for Mexico and outside of Mexico. We need people like him. It’s so sad. He was such a nice man, such a good friend, and…ah, we miss him. I miss him. Mexico misses him. It’s difficult to accept that he’s not here with us anymore—but his music is. What is your favorite thing about performing Don José, your character in Carmen? My favorite thing about him is he is a great opportunity to act. The character starts as a normal person—a strong man, with character. He’s strict, solid. And then when Carmen appears, he becomes a weak man. This woman destroys him; she’s like a poison, or a virus. It’s like when you’re sick—you don’t want to be sick, but you are. He becomes crazy for this woman, and he doesn’t have any time to think like a normal person. He hates this! And you, as a performer, need to show that to the audience. You have a great opportunity to make this transformation from good to bad to, at the end, evil. He becomes like an animal, almost like a monster. But, he became like that because of her. And she’s the same from beginning to end. She doesn’t change. She is arrogant, selfish, and sure of herself. She gets what she wants, and then she’s done. She only likes José because he doesn’t like her. He says in the beginning, “I don’t like these Andalusian girls.” He prefers someone like Micaëla. She’s a lady, with manners, and she reacts as a normal person does. [Laughs] But Carmen is like a cat. When you call to her, she goes away. But as soon as you are not paying attention…Meow! She’s at your leg.